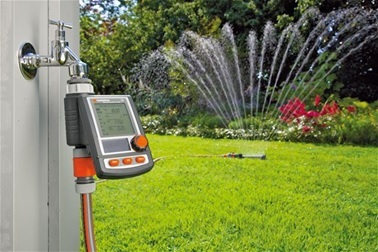 Let’s assume that remembering to water your plants is something that can easily be forgotten, well this is not something you have to remember if you have a water hose timer. Not only is it useful for when you forget, but also for when you’re out for the day or when you’re on holiday. You can set the duration and frequency of water flow accordingly. 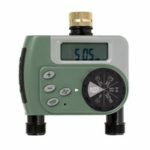 It’s very straightforward to install, it simply connects to the garden tap which then allows you to connect the hose to the water hose timer. This smart device acts as an automatic watering system for plants, assuming it’ll be connected to a sprinkler as this will automatically turn on according to your settings. 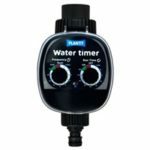 Getting the timing and amount of water right will not only help your plants grow and keep them healthy, but it can also save on your water bill as you might have left the sprinkler on for too long otherwise. If you also need an indoor automatic watering system then our self-watering planters will do just that. 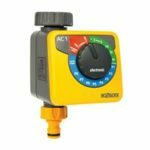 When it comes to selecting the best water hose timer, the most suitable one can depend on the type of plants you have and your lifestyle. Below are the associated features which we’ll go through in order for you to choose the best option. Watering duration – Whether you set a programme or manually use the hose, you can set how long you want the watering duration to be on for. Some water hose timers will allow the duration to be as long as 4 hours, whereas the maximum on others will only be 1 hour. 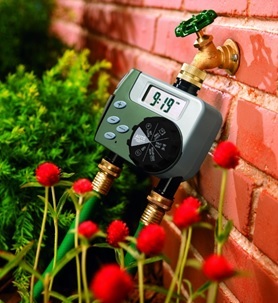 Watering schedule – Set how frequent you want the water timer to allow water flow. 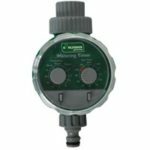 With most water timers it can be as frequent as every hour or as infrequent as every week. 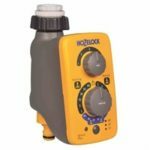 The Hozelock Sensor Controller Plus has a sensor where it’ll automatically activate every sunrise and sunset. 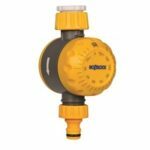 Manual override – If you need to use the garden hose for other things such as washing your car, cleaning garden furniture such as your sun lounger, picnic table, etc, then you can manually override the sprinkler timer. Manually overriding will allow you to use the tap like you usually would, however on some devices this might interrupt your pre-set programme and you’ll have to re-set it again. 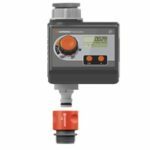 Models such as the Orbit digital water timers will allow you to override to gain access to water without interrupting your pre-set programmes. Rain delay – Prevent overwatering your plants, if it rains and the sprinkler timer is set to come on still then this can lead to drowning your plants. The rain delay function will postpone water hose timer from letting water flow. Outlets – Having more than one outlet is perfect if you need to water separate plants that have different watering requirements. This allows you to control and have separate pre-set programmes for each individual outlet. 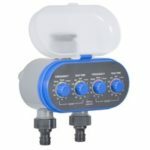 If you have plants in different areas of your garden and they have the same watering requirements then you can simply use a dual tap connector. 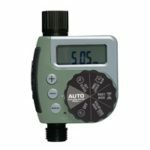 Batteries required – Most hose timers will require batteries and many will have a low battery indicator so you can replace them before it runs out. 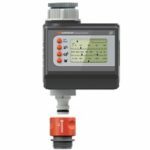 LCD screen – An LCD screen might be more user friendly since you can see what settings you have selected, whereas without it you might have to refer to the instruction manual in some cases to see what certain settings mean.